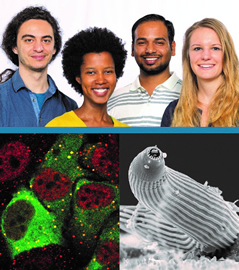 Our PhD program in the life sciences places special emphasis on interdisciplinary interactions. We want to train the next generation of scientists to study complex biological processes that cannot be adequately understood within the limits of a single discipline. By combining methods and approaches from different scientific fields, our students aim to address topics inaccessible to isolated research areas. Our program is based in Tuebingen, a hotspot for science and research in southwest Germany. Tuebingen is home to one of Germany’s oldest universities and numerous top-level research institutes. Compact and friendly, with a beautiful medieval town centre, modern Tuebingen has a lively, international feel, with cultural and entertainment opportunities to rival larger cities. For international travel, Stuttgart International Airport is reached in 20 minutes. Apply online via www.imprs.tuebingen.mpg.de. Deadline for the application February 15, 2019; short-listed candidates will be interviewed during April 8-12, 2019.
Who can apply? Anyone - female or male, any nationality or background - who meets our academic requirements is encouraged to apply.